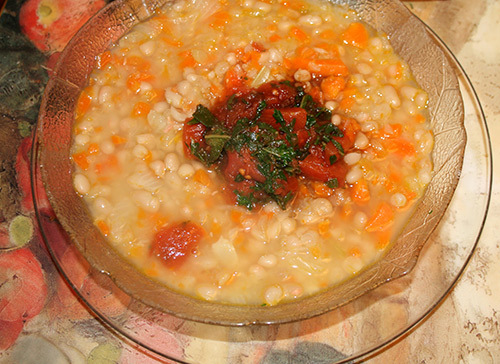 Another inspiring soup from Kalyn’s Kitchen. I used chicken instead of turkey, and this was so perfect for our nasty February weather. The balsamic vinegar really finished off all the flavors beautifully. Heat olive oil in a large soup pot. Add onions, celery, and dried sage, and saute 5 minutes. Add the broth and cabbage, and simmer covered about 30 minutes, or until the cabbage is well softened and even starting to disintegrate into the soup. 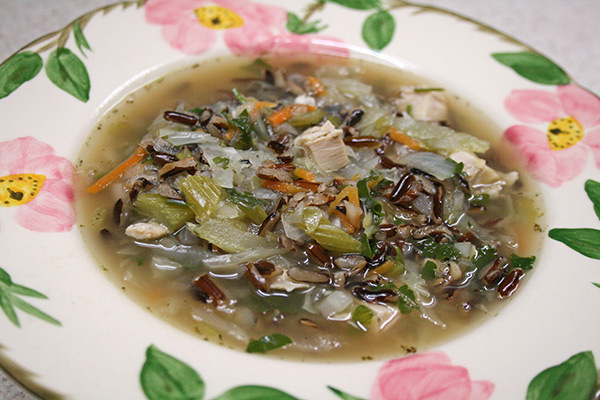 Add the chopped chicken, cooked wild rice, and chopped flat leaf parsley, turn heat to a low simmer, and cook, uncovered, for about 20 – 30 minutes more. Stir in the balsamic vinegar (start with 1 tablespoon, and add more to taste if you desire). Serve hot. Makes 6 servings. Here’s my delicious adaptation from this delicious recipe. Cut zucchini in half lengthwise. Scoop out insides, leaving shells about 1/4″ thick. Reserve about half of the insides. Heat 2 tablespoons olive oil in a skillet on medium high heat. Saute onion and garlic til soft. Add mushrooms and reserved zucchini insides, and saute another 2 minutes. In a separate skillet, heat 1 tablespoon olive oil on medium high heat, and add the crumbled sausage. After it is browned, stir in the onion and mushroom mixture from the other pan. Add the wine. Stir in the tomato, basil, and rosemary, and cook 1 minute longer. Drain any excess fat. Remove from heat and set aside. When cooled, add the soy cheese, egg, salt, and pepper. 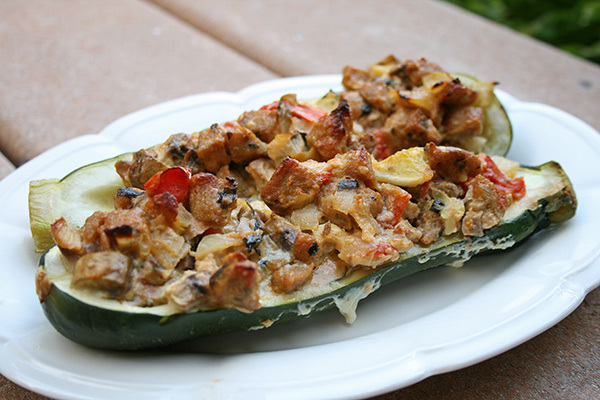 Fill the zucchini shells with the mixture. Fill a baking pan with 1/4″ water. Place the filled zucchini halves in the pan and bake at 375 degrees F for 40 minutes, until golden brown. Remove from pan and serve immediately. Makes 6 servings. I made this dish during the summer, and just seeing it sitting on my deck table makes me want to pine for warmer weather. I think I’ll make it again this week, and maybe I can be transported. Very Italian, very good, dairy-free. Cook the manicotti according to package directions. Drain, rinse with cold water, and leave the manicotti in water. In a large heated skillet, crumble the sausage and saute til browned. Mix in the mushrooms and cook until they are soft. Transfer this mixture to a large bowl and let cool for 10 minutes. Mix in the spinach, tofu, and nutmeg. Season with salt and pepper. Carefully spoon this mixture into each manicotti. In a large baking dish, spoon enough pasta sauce in the bottom of the dish to lightly cover. 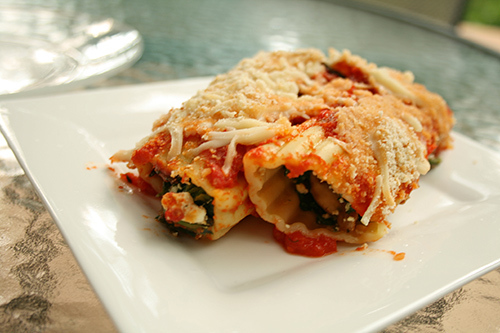 Place a layer of stuffed manicotti on top of the sauce. Pour 1 cup of pasta sauce over the manicotti. Then place another layer of manicotti, and the rest of the pasta sauce. Sprinkle with the soy cheese and the breadcrumbs. Bake at 400 degrees F until the cheese is browned and melted. Makes 8 servings. From Eggs on Sunday blog. The garnish adds a special touch. Heat olive oil in a heavy large pot over medium heat. Add the carrots, onion and celery, and cook for about 5 minutes, until the onion has softened. Add the beans, 10 cups water, smashed garlic, and bouquet garni. Bring to a boil then turn down heat to medium-low and simmer for about 45 minutes. Add 1 1/2 teaspoons salt and continue to cook for another 1/2 hour. Then with either an immersion blender, food masher, or food processor, puree a portion of the soup til smooth. Season to taste with salt and pepper. To make the garnish: in a small saucepan, heat the olive oil until it’s hot. Then add, all at once, the drained diced tomatoes, garlic parsley, and sage. Stir for about 30 seconds. Serve the soup with a good spoonful of the garnish in each bowl, and a drizzle of balsamic vinegar. Makes 8 servings. Sometimes I see a recipe that I know I have no business eating (major dairy content), but I still go for it and make all the non-dairy subs. This one is one of those. I not only used soy cheese for the real stuff, but instead of making the prescribed dough, I just used some frozen nondairy puff pasty I had on hand. This was the lazy man’s way out, but we both thought the results were superb. For the real, true recipe, read here. Thanks for the inspiration, Smitten Kitchen! Roll out 4 squares of puff pastry and line 9″ pie plate – it doesn’t have to look perfect. Give it a more rustic look – it will taste just as good. Set aside. Preheat oven to 400 degrees F. Whisk together mayonnaise and lemon juice. Halve lengthwise the grape tomatoes. 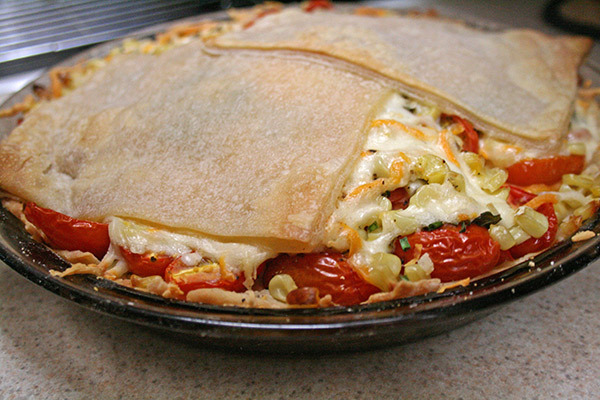 Arrange half of tomatoes on the crust, overlapping, and sprinkle with half of the corn, one tablespoon basil, 1/2 tablespoon chives, 1/2 teaspoon salt, 1/8 teaspoon pepper, and one cup of grated soy cheese. 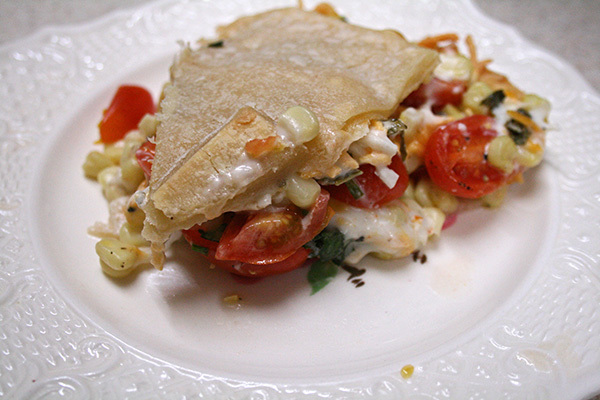 Repeat layering with remaining tomatoes, corn, basil, chives, salt, and pepper. Pour lemon mayonnaise over filling and sprinkle with remaining cheese. Roll out remaining 2 pieces of puff pastry and lay across the top of the pie. Bake pie until cruse is golden and filling is bubbling, 30 – 35 minutes, then cool on a rack. Serve warm. Makes 4 – 6 servings. 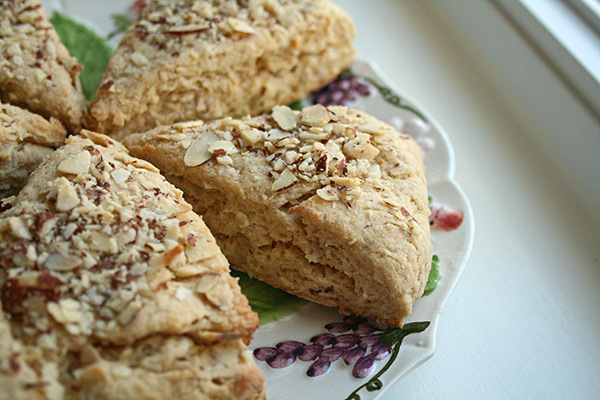 Scones traditionally call for buttermilk, cream, yogurt, or some other dairy ingredient. I have found that plain soy yogurt makes a fabulous buttermilk substitution in many baked recipes, and here I used it in place of half and half. I modified this from the original, and I thinned my soy yogurt out ever so slightly. The results were fabulous. Whisk together the flours, sugar, salt and baking powder in the food processor (or by hand). Cut the margarine into small pieces and drop into the processor bowl (you can also mix in the margarine by hand). Pulse several times until the dough resembles coarse meal. Stir in the chopped almonds (save in a small bowl about 2 tablespoons of the chopped almonds for later). In a large bowl, whisk together the yogurt, creamer, egg yolk, vanilla and almond extracts. Add the dry ingredients into the wet ones, and, using a fork, give it a few stirs just so the ingredients are combined. Then, using your hands, gather up the dough right in the bowl and turn it over a few times, pressing it against the side of the bowl (like a soft knead). Do this about 5 – 10 times, just until the dough seems to be holding together and most of the stray bits of flour are incorporated. Turn the dough out onto a lightly floured surface. Pat the dough into a 1″ thick disc. Using a sharp knife, cut the disc into 8 wedges. Place the wedges on a baking sheet lined with parchment paper. Top each wedge with a sprinkling of the reserved chopped almonds, pressing lightly down on them with your fingers, so they stick to the top. Bake the scones at 400 degrees for 15 minutes, just until the edges are lightly browned. Makes 8 scones. Comfort food, Umbrian-style. A perfect cold-weather dinner with your favorite bread. In a saucepan, heat 1 tablespoon of oil; add the turkey bacon and cook until crispy. In a food processor, finely chop the carrot and celery. Add the vegetables to the saucepan along with the onion and garlic and cook, stirring, until the vegetables are softened, 7 minutes. Add the tomato paste and stir over moderately high heat until shiny, 1 minute. Add the lentils and 2 1/2 cups of the broth and bring to a boil. Simmer over low heat, stirring occasionally, until most of the broth has been absorbed, 25 minutes. Add 1 more cup of broth and continue simmering until absorbed, 10 minutes. Add the remaining 1/2 cup of broth and simmer until the lentils are tender and suspended in a creamy sauce, 10 minutes longer. Season with salt and pepper. In a large nonstick skillet, heat a thin film of olive oil. Crack the eggs into the skillet, season with salt and cook over moderately high heat until the edges are golden, the whites are just set and the yolks are still runny. 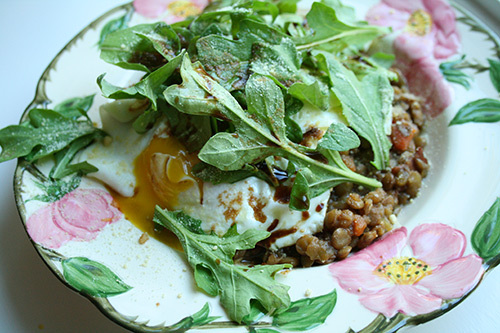 Spoon the lentils into shallow bowls and top with the eggs and arugula. Add the soy cheese over the eggs and drizzle with balsamic vinegar. Serve immediately. Makes 4 servings.